Pierce Hayes and Johanna Finigan survived the Great Famine here in Co Tipperary and emigrated to America as very young children. Local Church and tenant records indicate that they had lived in the town-lands of Derry, Curraghmore, Clougherailymore, and Clougherailybeg, in East Loughmore, near Thurles. Other surnames attached to the ancestral family through marriage include the inevitable Irish names of Ryan and Maher. Back L-R: Joseph, Paul, Vincent, Patrick. Seated L-R: Bernardine, Rita, Therese, Mary, Louise. The emigrant families remained in close contact while in Massachusetts. Pierce Hayes went on to join the Union Army during the American Civil War and was seriously wounded in 1861. Pierce and Johanna later married in Massachusetts in 1862. Fast forward now four generations and we come upon a descendant Hayes family of nine siblings, all born in Norwalk, Connecticut, but now spread all across America. 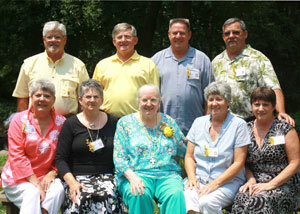 On June 13th, 2010, the eldest sibling, Therese Hayes, celebrated her Golden Jubilee, fifty years dedication to her convent. Sister Therese is a member of a small order, The Medical Mission Sisters, headquartered in Philadelphia. She spent her early years working for a hospital in Ghana and later doing inner-city AIDS mission work in Philadelphia. The convent has published several brief articles recalling her devout and dedicated service. (See Links http://www.medicalmissionsisters.org/healing/AIDS.htm and http://www.medicalmissionsisters.org/healing/200yearsinmission.htm. In celebrating her Golden Jubilee in June, Sister Therese was joined by all eight of her younger siblings and an additional twenty nine nieces, nephews, spouses and friends. Indeed, such grand family reunions are organized every few years. Brothers Paul, Vincent, and Patrick last visited their ancestral town-lands in Loughmore in February of this year, 2010, when they were briefly the guests of Thurles Town Mayor, Mrs Evelyn Nevin and Thurles Town Clerk, Mr Michael Ryan. There are now 115 descendants of Pierce and Johanna living in America who can trace their ancestry directly to these two famine children from Loughmore East. May the blessing of light be on you—light without and light within. May the blessed sunlight shine on you and warm your heart, till it glows like a great peat fire. Note: If there are any people out there who can shed further light on the Hayes and Finigan family roots here in Loughmore, we would love to hear from you and we will be happy to put you in contact with their American descendants – they would love to hear from you. My great great grandfathers are McKaine Roberts and William Hayes. Do I have any relations in your group? I have passed your comment and contact details to Mr Patrick Hayes. Patrick has a huge amount of info. gathered, so I do hope you are connected.